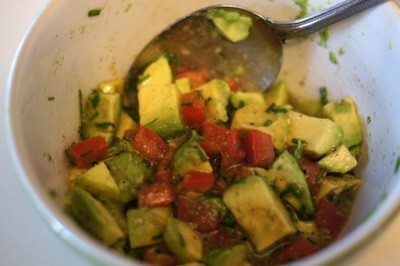 Many years ago, I learned to make a very versatile avocado-based salsa from the great chef and teacher Jacques Pepin. He used it to top crab cakes with, but you can use this simple and delicious sauce --- with a wide range of fish and seafood dishes. I like to serve it with grilled fish, especially. It's a wonderfully fresh-tasting, summery accompaniment for seafood. Peel and pit the avocado, coarselybchopping it, as well. 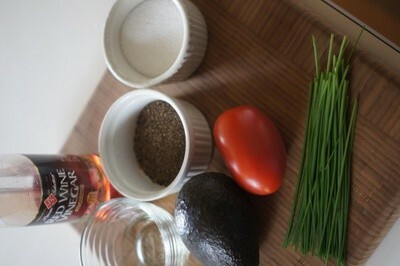 In a small bowl, combine the tomato, avocado, vinegar, peanut oil, chives, salt, and pepper and stir to mix well. That's all there is to it! Serve crab cakes, fish, shrimp, etc. 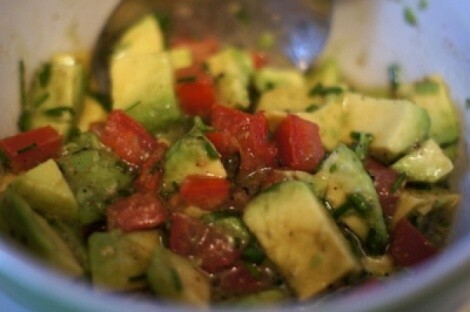 on a bed of salsa, or top the seafood with it. 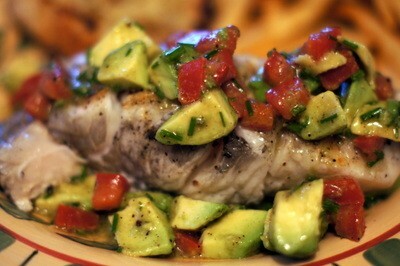 Pictured here is grilled halibut with salsa.